Sturdy & proven construction to Withstand severe & extreme environments. Fully Thyristorised, HEXAPHASE Infinitely variable ARC voltage setting over the entire range from minimum or maximum with fine control. Automatic voltage stabilization offers smooth and easy operation over all the controls. Modular design offers complete flexibility and instant adaptability to cover a wide area of application. Design with indigenous components offers flexibility & ease of servicing with low downtime. Specially designed to adapt for operation on tractor driven and stationary position. Both Arc voltage & welding current can be controlled with two knobs from the same control panel mounted on the trolley-a unique feature. 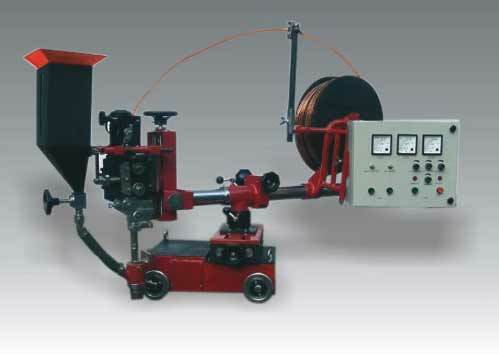 Interconnection cable between (power source & Trolley) Comprising of Control & Welding Cable 5 mtr.